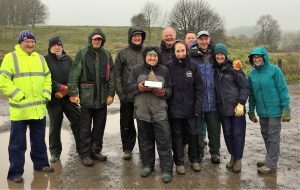 The Mendip Hills AONB Partnership have announced their Volunteer of the Year for 2018. Richard Ellis, from Cheddar, is this years well-deserving recipient. The award is made to the volunteer who the AONB Unit think has gone above and beyond a normal volunteering role. Richard was announced at the recent AONB Partnership meeting but the award was given to him at the next practical task session that he regularly attends. Richard is a one of our long standing Volunteer Rangers regularly committing lots of time to visit Deer Leap and other sites to pick up litter, report problems and say hello to visitors. He also volunteers on our practical tasks to mend drystone walls and improve wildlife areas. Richard is one of the unsung champions of the area, relentlessly giving up his time to make sure the Mendip Hills remain amazing for residents and visitors. The AONB Partnership strive to involve people in the management of this nationally protected area and through the AONB Unit offer a wide variety of opportunities. For more details click here or call 01761 462338. Richard Ellis receiving the 2018 Mendip Hills AONB Volunteer of the Year award, presented to him by Sammy Fraser and other volunteers in typical Mendip weather.